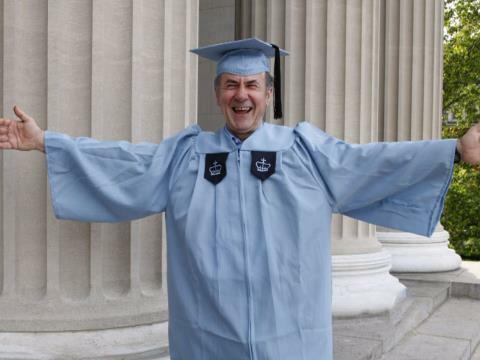 Ivy Coach salutes this Columbia University graduate who has inspired so many. We’d like to bring your attention to the inspiring story of Gac Filipaj, a man who has spent the last twenty years learning English and working as a a janitor at Columbia University. When he fled war-torn Yugoslavia back in 1992, he took a job at the Ivy League’s Columbia University. But he wasn’t content to simply do a wonderful job as a janitor — and Mr. Filipaj takes great pride in his work — he wanted a first-rate education. Since Columbia University employees are allowed tuition exceptions for a certain number of classes each semester, Mr. Filipaj chose to capitalize on this opportunity (this kind of opportunity is common at Ivy League colleges though few employees take full advantage of it). It took Mr Filipaj twelve years to finish his B.A. because he was limited to the number of courses he could take each semester not to mention he was working a full-time job throughout. And this Sunday, he will be a Columbia University graduate…and with honors from the School of General Studies. His degree? Classics. On a sad note, Mr. Filipaj sincerely regrets that he never told his father (who died just three weeks ago) that he was attending Columbia as a student. We’re sure his father would be very proud of him. What an incredibly moving story! Do you think it will be the next “Good Will Hunting” kind of movie? Let us know your thoughts by posting below!